In the crowded business landscape, firms are constantly under pressure to differentiate from competition…and then capitalize on this advantage. Traditionally, businesses tout their ability to create value for customers. Marketing and monetization expert Marco Bertini believes, however, that businesses routinely fail to think through the critical next step: they don’t have a clear sense of how to convert value into lasting revenue. A talented and engaging speaker, Professor Bertini studies what he calls the “back end” of customer centricity, or the means by which organizations earn a profit from their efforts to stand out and serve markets. Bertini – named to the Thinkers50 Radar, a shortlist of scholars “most likely to shape the future of how organizations are managed and led” – teaches how, in general, companies are excellent at creating value but lousy at capturing it. To him, most companies see pricing simply as a dry exercise in “running the numbers.” Pricing has an image problem. In fact, pricing is much more than spreadsheets and formulae. First, it is deeply strategic: the right policies underscore a company’s position and advantage. Second, it is both art and science: prices can equally attract or offend, delight or disrupt. Professor Bertini’s views on monetization – a unique blend of economics, psychology and sociology – are helping business leaders make the most of the offerings they proudly bring to market, build stronger brands and strengthen relationships with customers. He tailors his speaking, hands-on workshops and advisory services to the specific challenges and opportunities of his audiences, which include marketers, communicators, finance executives, sales professionals and entrepreneurs. Bertini’s methods for establishing strong, sustainable revenue strategies are highly sought after, as exhibited by his extensive corporate training relations with large firms such as Coca-Cola, H&M, ExxonMobil, Boston Consulting Group, Ericsson, Hewlett-Packard, IBM, Pfizer, P&G and PwC, as well as a distinguished portfolio of startups. At the same time, Bertini’s research appears in leading journals for marketing practice and science, including Harvard Business Review, MIT Sloan Management Review, Journal of Consumer Research, Journal of Marketing, Journal of Marketing Research and Marketing Science. His work and commentary often feature in top media including the BBC, Financial Times, Strategy + Business, The New York Times and The Wall Street Journal. Bertini is professor and director of the marketing department at ESADE. He received his doctorate from Harvard Business School and previously served on the faculty at London Business School. He has been nominated for the Business Professor of the Year award, a global competition held by The Economist Intelligence Unit, and recognized by the Marketing Science Institute as one of the most promising scholars in the field. Marco Bertini is available for paid speaking engagements, including keynote addresses, speeches, panels, conference talks, and advisory/consulting services, through the exclusive representation of Stern Speakers, a division of Stern Strategy Group®. Case Study: Can One Business Unit Have 2 Revenue Models? Will Customers Be Fair When They Pay-As-They-Wish? Your Pricing Needs a Strategy! Every business has to price what it sells. It is inescapable and indispensable, yet also deeply misunderstood. Marco Bertini explains that most professionals characterize pricing simply as an exercise in running the numbers – a tactical problem where creativity is superfluous. In fact, prices educate and stimulate customers as much as they mark value. And pricing questions are as much about strategy (What business are we really in? How do we convince customers without eroding goodwill? Can I be the price leader in this market?) as they are about dollars and cents. Bertini talks broadly about the “mission” of pricing and the steps organizations must take to improve this basic business skill. Getting it right unlocks unexpected opportunities to capture value, and even to grow it. The digital revolution affects just about every part of a business … including how it prices. What is important now is understanding what aspects have changed, how and why they did change, and, importantly, what we can do about it tomorrow. This session stresses four mega trends that are disrupting pricing potential: accountability, transparency, fit, and automation. Failure to understand how each of these forces affects your environment virtually guarantees that you are not tapping the full potential of your customers. Importantly, it also signals that you are exposing the organisation to serious threats. The classic notion of “pay me for what I make” is virtually risk free for a business, and therefore seductive. Yet, customers are increasingly keen on transparency and accountability, and technology is no longer a constraint when it comes to understanding, measuring or charging for value. The result is fascinating: Just about every industry is heading toward outcome-based compensation—albeit at different speeds. This journey makes sense, as customers ultimately pay only for the solution, not some inferior proxy. More important, it moves through clear stages of evolution, which means managers have the chance to act. Marco Bertini helps remove the complexity and confusion inherent to designing an intelligent revenue model. He breaks down the challenge into a small set of levers and principles (What decisions do I face? How should I decide?). He also shares examples of different businesses that, proactively or otherwise, have embarked on this journey. Prices and pricing are something that executives seldom talk about with enthusiasm, especially to their customers. But this is shortsighted, as in fact few levers in business pack the same strategic punch. It may not seem like it at first, but a price is far more than a number; it is also a means to sort the good customers from the bad, nudge customers into doing the “right” thing, advertise your competitive advantage, and stir lasting emotions. When all is said and done, the elephant in the room is a powerful but misunderstood ally. How do you know when the price is right? To answer this question we first must appreciate how important it actually is, says Marco Bertini. When properly understood, the benefit from an accurate price dwarfs any other driver of performance. Bertini highlights four key sources of information: cost, competitor, customer and company. (Managers know these “4Cs” matter, but they don’t necessarily know how to process and combine this information.) 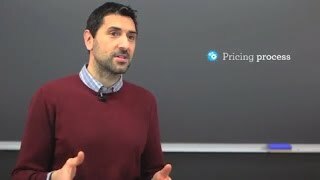 In this talk, he presents an intuitive framework, and explains why finding the “perfect” price implies striking a balance between looking inside and outside the firm for inspiration. Bertini emphasizes that the starting point is always the organization’s differentiation from competitors. Perceptions of value are not only measurable, but also malleable. Indeed, customer preferences are not as clear and stable as the classic economics textbooks predicate, explains Marco Bertini. Rather, one’s needs and wants can shift across situations and time in ways that researchers in psychology and sociology have been mapping for years – and that business people are only now starting to grasp. Bertini helps audiences understand how the nuances of human thought and behavior influences even the most mechanical of pricing decisions. He explains some of the popular anchors, nudges and charms at the disposal of organizations interested in motivating and empowering customers. As Bertini explains, it’s a critical, differentiating ability for any business facing customers who appear disinterested in anything but low prices. At the heart of every proper pricing strategy lies the set of actions businesses take to document and communicate value to their customers. Indeed, Marco Bertini subscribes to the belief that “when the value of an offering is clearly understood by both firm and customer, price is seldom a problem.” This talk discusses the complications that often arise when an organization tries to sell value in a market plagued by stubborn, cynical buyers. Specifically, Bertini introduces a five-step framework, highlights remedies and draws several conclusions. Two stand out. First, a better understanding of what “value” means to customers, and how the firm can be true to its promises, gives a sense of calibration and confidence that helps fight off the pressure imposed by clients and competitors. Second, a better process to sell value quickly improves the performance of the firm – and this improvement is enduring.